We live in a time of culture wars. Not just the glaring worldwide international conflicts of, say, Jihad versus McWorld, but of petty and nearby discord on the streets where we live. From avoiding neighbors of another color, to insensitivity to diets or calendars of another’s religion, to presuming a language or abilities and on and on. The culture wars of everyday life chip away, bit-by-bit, at our hope for just getting along. This is the real daily grind – an endless state of insolence that leaves you feeling alien to all. Nowhere is this more evident than in classrooms teaching about diversity and social equity in public affairs. According to the American Association of Colleges and Universities, over 60 percent of U.S. undergraduates are required to study diversity issues. Cultural competency is a standard part of the curriculum of public administration and policy programs accredited by The Network of Schools of Public Policy, Affairs, and Administration (NASPAA). Related fields, such as criminal justice, now require diversity curriculum. Excellent texts have emerged within public administration on diversity and social equity issues. The focus is on conflicts of race or gender, with a theme of multi-cultural sensitivity. However, public agencies routinely record a much broader range of diversity and social equity conflicts, including race, ethnicity, religion, sexual orientation, gender, disability and other categories. The seriousness of these diversity conflicts ranges from extreme hate crimes to micro-aggressions, with most in-between including civil liabilities or workplace policies violations. For example, the FBI has collected hate crime statistics since 1990 by race, ethnicity, religion, sexual orientation, disability, as well as victim gender. While race and gender remain important foci in diversity issues, there are also pressing conflicts with ethnicity, religion, sexual orientation, disability and other diversity issues. What about the bigger picture? Cultural competence proceeds from multiculturalism, in which we seek social equity by celebrating our differences. But the reality of diversity is one of mixed-culture rather than rigid cultural stereotypes or silos. Multiculturalism stands in reaction to an older assimilationist approach, which urged that we celebrate community through sharing, even by rigid Anglo-conformity approaches and mono-cultural literacy. But we are too highly diverse to ignore our many differences. Both multicultural and assimilationist approaches may seek an end to the culture wars by silencing or ostracizing those who are offensive in order to insure a pleasant celebration. Therein lies the rub, however, as Ronald Dworkin argued in Freedom’s Law: The Moral Reading of the Constitution, “If we abandon our traditional understandings of equality for a different one that allows a majority to define some people as too corrupt or offensive or radical to join in the informal moral life of the nation, we will have begun a process that ends, as it has in so many other parts of the world, in making equality something to be feared rather than celebrated, a mocking, correct euphemism for tyranny.” Multiculturalists and assimilationists seem to wear their sought-after social equity like a sword, creating an equality to be feared rather than celebrated. Both would sacrifice our rights to freedom in order to either protect the celebration of differences or to preserve the shared community. Both may allow creation of a tyranny in order to force us to be free. I worry that multiculturalists and assimilationists may be throwing out the baby with the bathwater. I think of Professor John Rohr’s influential notions on how constitutionalism may best inform our public morality on issues like equality, i.e., Ethics for Bureaucrats. A celebration without freedom is no celebration at all. Instead, what if we embraced the human rights that seem to be sacrificed by multiculturalists and assimilationists? What about a human rights perspective to reconcile conflicting cultures to live in mutual respect, rather than in tyranny? And also allow for the mixed-culture American diversity, rather than forcing people into rigid, balkanized camps or silos by cultural stereotypes? The human rights perspective typically offers a minimalist, rules-of-the-game approach incorporating both respect for diversity and rich commonalities. It arose after WWII out of a felt need to respond to Nazi war crimes. The human rights perspective posits individual, universal claims (not only moral aspirations) that impinge real obligations upon society. 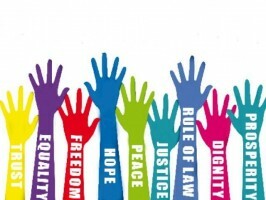 The individual person has a stake upon society through human rights, in addition to a part of the common good. Human rights are not limited to places or times in our elucidation of them, e.g., the Constitution. American public affairs were founded on such a human rights perspective, such as the rights of the people to self-determination and sovereignty over their natural estate, and to “life, liberty and the pursuit of happiness.” Every generation since the adoption of the Constitution has revisited this set of rules that bind us together. Public administration scholar Jay Sigler applied this perspective to diversity issues in public affairs in Civil Rights in America: 1500 to the Present.